Last week, I exposed a fake personality ‘test’ that is being forced on unemployed people by the Department of Work and Pensions’ (DWP) Jobcentre Plus (JCP) centres. This ‘test’, which presented a ‘personality profile’ to respondents that was completely unrelated to their personality, was so completely bogus that it even provided a ‘profile’ if you clicked through all the questions without answering them. Moreover, if you go through the test and answer ‘very like me’ to every one of the 48 questions, you will receive exactly the same results as if you go through it and click ‘very unlike me’. Not only is the test a fake, but it was devised by the US psychologist who designed the ‘psychological torture’ programme used by the CIA and US military, which includes among its methods the infamous ‘waterboarding’ technique designed to make victims feel as though they are drowning, over and over again. It’s plain that this test has nothing to do with offering claimants genuine, helpful information. Instead, it appears to be a naked attempt to cynically manipulate unemployed people into certain behaviours whether or not it is in their best interest given their personal strengths and weaknesses. Unemployed people are being forced to take this ‘test’ by the threat of ‘sanction’ – that they will lose their benefits if they fail to comply with the instruction. In a context where some claimants are committing suicide because of the fear of losing their benefits, to instill the fear and stress that the threat of sanction must inevitably create, simply to coerce them into taking a ‘test’ that is meaningless, is not only psychological torture but reckless, dangerous, and quite possibly criminal. And it turns out that there is a government department that agrees that it is illegal for the DWP to impose this ‘test’ on benefit claimants. The DWP. The letter advises the claimant that the instruction to take the test is a ‘Jobseeker’s Direction’ (JSD). A JSD is a very specific instruction issued by JCPs to the unemployed – an instruction that can lead to benefit sanctions if it is not obeyed. It is therefore extremely coercive – but it is not supposed to be employed just anyhow. ‘Fruit of the poisoned tree’..
A JSD in writing will be a document that asks or advises claimants to take a particular course of action that can help them find employment or improve their chances of being employed. Clearly, taking a test that has no connection whatever to your actual personality does nothing to help you find employment or become more employable. On its own, this makes the JSDs imposing the test invalid – and any sanctions resulting from them invalid too. But we’re not done yet. If an Emp O gives or sends a letter to a claimant asking them to attend at a Jobcentre Plus office or other place without explaining why, or just tells them to telephone but does not tell them why this will not be a JSD. The JSD must explain why the jobseeker is being directed to attend a particular place. Item 34593 establishes the principle that a jobseeker must be told why a JSD is being given for it to be enforceable. The letter, as you can see above, does not give any indication why the test must be completed, beyond a generic ‘in order to help you [find work] we require’ it. No indication is given as to how taking this ‘test’ will help, and the fact that the ‘test’ is bogus means that it is not meeting even this vague aim. While not conclusive in itself, taken in context this vagueness and lack of substance means that the JSD is extremely questionable and liable to legal challenge. While the examples given relate to reasonableness in terms of feasibility, it is extremely doubtful that any court would consider that ordering someone to take a meaningless test is in any way ‘reasonable’. 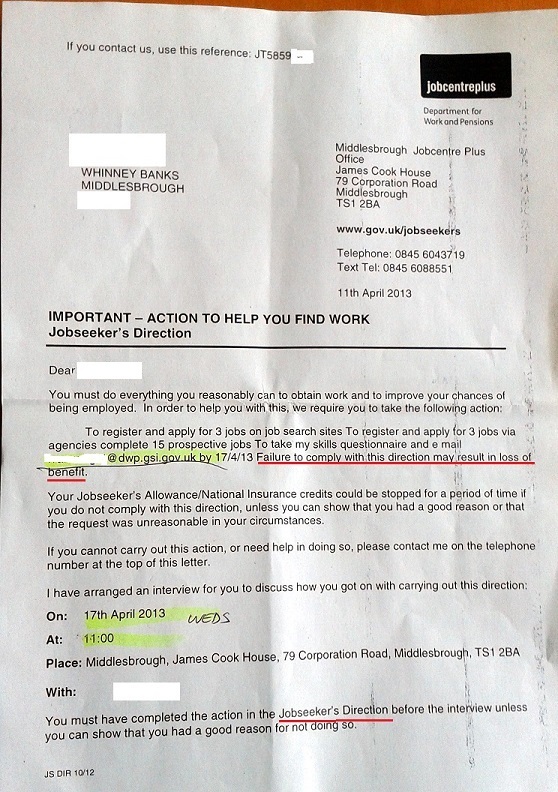 Given the intimidating nature of the test and the other instructions issued with it, and the increased likelihood of limited literacy skills among the people on whom it is imposed, the DWP has almost certainly imposed sanctions on claimants for failing to comply with what appears to be a thoroughly illegal instruction that does not meet the standards for a valid ‘jobseeker’s direction’. Since this test has been used for some time in at least 3 regions and is now being rolled out in others, the number of people penalised in this way could be substantial, and the sanctions imposed could run into millions of pounds. Not only that, but by inflicting undoubted stress and distress on people using a legally illegitimate and unreasonable instruction, the DWP could face compensation claims running into the tens or even hundreds of millions of pounds, if any claimants decide to seek legal redress. And the DWP is damned by its own words, from its own handbook. No wonder it didn’t want you to know about this reckless, cynical ‘test’. They could use 34585 “improving the claimant’s chances of being employed” – the could say that the test boosts our self-esteem and helps us concentrate on our strengths. Yes, the test is pointless and misleading. However, it’s the same when they make you attend a CV writing course and it turns out you know more about resumes than the “teacher”. It’s pointless and wastes time. Or they could say that we misunderstood it altogether and they meant just the job application part to fall under the directive. They can say whatever they damn well like, it’s what a court decides that counts and again here there’s little reasonable doubt IDS and his department under his instruction are acting unlawfully if not illegally. When is IDS going to jail? I think that by Tory’s standards, he’s earned himself a ceremonial funeral by now. THe test is utterly ridiculous and does nothing but cause stress and upset, and waste money. Having recently lost my job, I went to sign on last week. I was going to be directed to three complusory courses in order to receive JSA; Basic Numeracy, Basic Literacy and then 2 and a half days on writing a CV. I have recently received a letter informing me that I am not entitled to benefit anyway so I’m spared the courses! Most ‘Directions’ and Sanctions applied against Jobseekers and the disabled are utterly arbitrary and vexatious. The powerpoint presentation that went along with this quiz, criticised the UK court system because after a person on low income is fined, the courts give them a tailored and affordable schedule of payments, to avoid them being forced into destitution. The ‘philosophy’ of IDS’s DWP is right there, with unreasonable and unachievable Directions being followed up with devastating sanctions that will leave individuals having to choose between food banks, crime or suicide – WITH NO DUE PROCESS involved. The retrospective legislation rushed in to deprive workfare conscripts of compensation awarded to them by a court also highlighted the problem. There was a clue when coalitionist Liam Byrne supported IDS, bewailing the fact that the govt would have had trouble finding the money to have paid this. Why? Because as govt figures if examined will surely confirm, the workfare money was not sitting unclaimed in the DWP pot – because it had never been budgeted for in the first place. Figures will show that the JSA budget (and now the ESA/WRAG one) contained only enough to pay 80% of those entitled to claim – WITH THE SHORTFALL TO BE MADE UP THROUGH VEXATIOUS SANCTIONS, APPLIED AFTER CLAIMANTS FAIL TO JUMP THROUGH FAKE HOOPS TO MEET FAKE AND UNACHIEVABLE DIRECTIONS. JSA/WRAG ‘offences’, such as failing to apply for an unsuitable job, need to be properly scheduled as civil (or even criminal) offences – like motoring offences or shoplifting. Every case then needs to be TRIED through local magistrates court, where personal circumstances can be taken into account, APPROPRIATE fines issues, and fair & realistic schedules worked out, to minimise hardship. IOW let the punishment fit the ‘crime’ and (in the words of their Powerpoint rant) true ‘justice be seen to be done’. Never put down to evil what can be put down to incompetence. If you want the strength “Love of Learning” to be no. 1 then you must strongly agree with “I am easily bored”, make sure everything else is neutral and the result will be love of learning at number 1.and the standard 5 moved down a place. Just to mention the reason for the issue of the Jobseeker’s Direction is on page 2. They’re on the form that shows the web link, but not on the letter with the JSD. I would have thought they’d have to be on the actual letter to make it valid? Ah! Yes, but p2 of this JSD doesn’t have anything about reasons for it. Oh dear, it should, otherwise it is invalid. Indeed. Unless the general ‘in order to help you do your utmost to find a job’ blurb at the beginning counts, but doesn’t seem like it should – far too vague. The new example is a nonsense and the work steps should have been included on the Jobseeker’s Agreement. A disgrace! Fine. I agree, it is dubious. The problem is that no one is able or willing to bring any legal challenge and even if they do they still face losing their means of subsistence at the stroke of a pen. What’s needed is an organization like a union or law centre to bring a legal action on behalf of claimants. Yes, it would. The problem is that Jobsseker’s do not know they are being abused. I help people where I can, but I am only one individual. MP’s, the CAB and welfare groups pick up the pieces. The personalised one is particularly interesting, since this is plainly a generic test (and that’s putting it kindly!). explain what will happen if they do not comply. The example above has more than one activity. Yes. The depth of research on no less than 15 companies is particularly unrealistic for poorly-educated people. Sorry, and the person has been given insufficient time. I could go on an on. We also do no know why it was issued, did they refuse to comply? No, this was the first they’d heard of it – and then it sent them into a panic! Yes, I have raised this matter with DWP. A Jobseeker’s Direction is really intended for people who are not trying their best and do not agree to take a step that is reasonable for their circumstances. Maggie;s JSD was not appropriate as the Adviser had failed to establish if she was capable of taking the step. That is apart from the fact the information provided was inaccurate. Ok, first well done for showing what a crap questionnaire the DWP test is. But you are making a bit of a mountain out of a molehill. Whoever sent the letter is just plain incompetent (the wording on the letter gives that away). However the hard parts of the JSD is the applications for jobs and not the filling out of some stupid questionnaire to which many people will skip through without much thought. To imply that the test is some evil doing of some evil Tory government is just asking for ridicule. The point isn’t the person issuing the letter, who looks to have poor grammar skills. The government is using a manipulative test designed by a psychological-torture guru, and imposing it on people under threat of sanction – as you rightly point out, alongside other, onerous tasks. I am studying Occupational Psychology, and the thought that ‘psychometrics’ are being abused in this way makes my blood boil. It gives psychology a bad name and it is manipulative. But I can’t even see what the government thought they were going to achieve. Why didn’t they at least use a validated test if they wanted to elicit any changes? My daughter’s doing her Masters in the same and has already written to the BPS about it as she was similarly outraged. The whole system’s designed to deny people their benefits. The WCA testing, for example, is based aorund the model developed by the American insurance company Unum with that in mind. You can find all sorts of interesting and concerning info about them by simply Googling for Unum scandal. They continue to act as advisors to the UK govt about this. Consider, if the benefits system can be made inaccessible then everyone would have to buy health insurance. Who’d gain from the opening of this multi-billion pound market? The answer’s Unum and the politicians (and through them their nudge units etc.) who helped them access it. Get it now? It’s public money being actively and openly spent against our interests. I don’t believe it’s actually illegal either, which is even more concerting because if we want to stop it we find the full forces of the law arrayed against us. We’d face secret courts where we wouldn’t even be allowed to know what the evidence against us was and we wouldn’t be getting exactly the best representation either thanks to Grayling and his changes to legal aid. These people in government are overtly thieving from the rest of us and they’re bedding themselves in behind the machinery of state to make sure they’re not interrupted while they do it. Revolution, anyone? I don’t see any other way. As far as I know, the BPS will take a dim view. You dont go nicking another psychologist’s test. Another psychologist can look at the report of a test/study and submit to do a replication, that is submit there hypothesis and rationale for doing the test/study again and advise how they would do it. it then goes through all the processes for approval. Therefore if the DWP wants to use a similar test, they need to devise their own with the rationale for doing it and submit for approval. From looking at all this, their breaking every ethics code there is. I know of people with mental health problems who have failed ESA and have wound up with JSA. If somebody who is rapid cycling (bipolar) and is in a euphoric phase takes the test he or she will be damaged by the result and may be tempted from taking their medication because of the unrealistically optimistic results. The test breaches the “reasonableness” conditions DWP themselves have set. I will certainly be in touch with my MP. Thank you! Yes, this is exactly the kind of potential problem the implementers of this test have ignored in the most reckless fashion. Have pressed this with the link to here, and added: Although this article from THE SKWAWKBOX BLOG is from last year, the issues raised here are even more relevant now, as the Government’s pet project, the Behavioural Insights Team (also known as the “Nudge” Unit) has extended it’s reach much further, including into the far Right’s political domain that entails the micro-management of the media. We can see that the welfare “reforms” were founded on basic ideas from the discredited pseudo-psychology called Behaviourism and the principles of operant conditioning. “Incentivise”, a word the Conservatives use a lot, is one that they claim is simply imported from the language of paternalistic libertarianism. We are reassured that the government are encouraging people to make “the right choices” for their own long-term benefit, by using “choice architecture” to change the decision-making context that is presented to the public. However, a government that punishes the poorest citizens with sanctions that entail the withdrawal of lifeline benefits can only at best be described as authoritarian and coercive. I’m currently working on an article about “Nudge” and the bogus psychology employed to manipulate the public by a psychocratic government. Please drop me a line when you publish it!